The importance of our author newsletter is reiterated by everyone from Joanna Penn to Mark Dawson. This is because our list of subscribers is something authors own. If Facebook or Twitter were to close down tomorrow, we’d lose our followers there—but we’d still have our newsletter. Readers who sign up for our newsletter tend to be the most interested in our work. These are the readers we want to alert to our new releases since they’ll purchase and review the books early, leading to better visibility on retail sites like Amazon. It took me a long time to finally put together a newsletter. I think part of the reason I was a slow adopter is because I already felt as though I were behind. If only I’d started years ago! But it’s never too late to start putting a list together and have it start working for you. You can make your newsletter signup pitch more visually appealing by encasing it in an image. Image creation is easy with a free tool like Canva. Create an image (I used a simple one with a book cover and my picture and a bit of text) and then hyperlink the entire image to your newsletter signup page (here’s how to find your signup form link on MailChimp). Do you need more newsletter subscribers? Consider giving away a free book to anyone who signs up for your newsletter. You could offer to give away Amazon gift cards, coffee mugs with your cover on them, etc. Are you linking to your newsletter signup in your email signature? On your blog? In the front/back of your books? On your Amazon/Nook/Smashwords/Wattpad/Goodreads bios? On your Facebook profile? Linking to the signup at reader-facing sites and in our email signature is a non-pushy way to get more subscribers. My readers seem to appreciate a personal tone in my newsletters. I include recipes at the end, a popular feature for cozy mystery readers. But aside from a personal touch and the recipes, they especially want to be updated on my book progress and any new releases. You can experiment with your newsletter content and its frequency, adjusting it for your genre and readers and what their interests are. 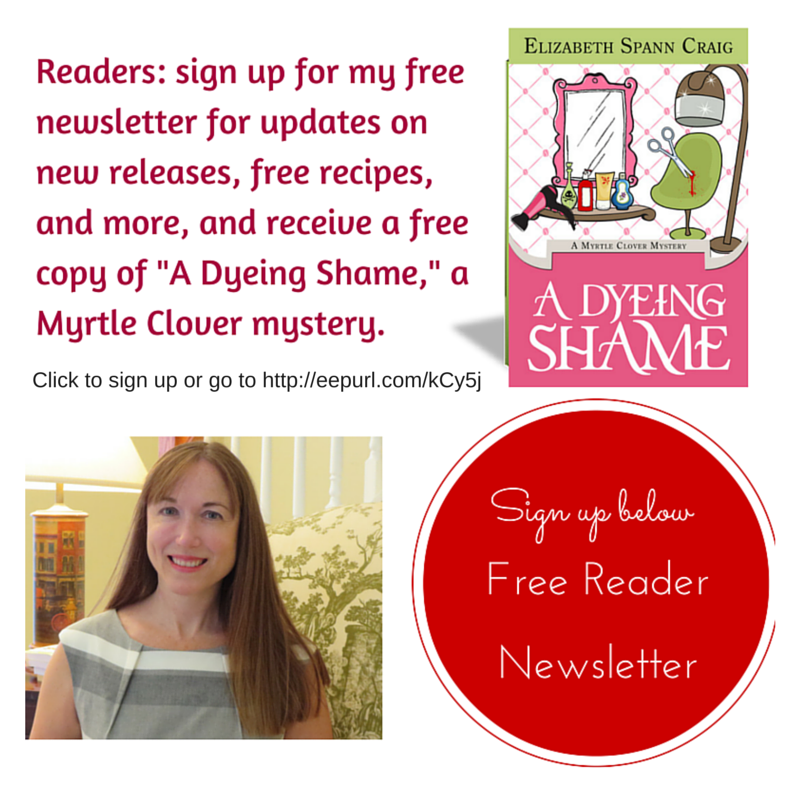 Do you have an author newsletter? What are your thoughts on service providers and frequency of contact with our readers? Elizabeth writes the Southern Quilting mysteries and Memphis Barbeque mysteries for Penguin Random House and the Myrtle Clover series for Midnight Ink and independently. She curates links on Twitter as @elizabethscraig that are later shared in the free search engine WritersKB.com and blogs at elizabethspanncraig/blog. Elizabeth makes her home in Matthews, North Carolina, with her husband and two teenage children. Thanks for hosting me today Alex and the IWSG! Thanks for joining us, Elizabeth! This is so useful, Elizabeth! Thanks. And thanks, Alex, for hosting. I agree that newsletters can be terrific marketing tools. For me, it's a matter of deciding what I would include in it, and how I'd make it unique (i.e. not what anyone could read on my blog). Hmm....time to put the thinking cap on. Excellent post. I haven't done a newsletter, and I won't anytime soon. I know to never say never, but my career has slowed down and honestly, I have little to tell. When I sell the movie rights I'll definitely start. Seriously. 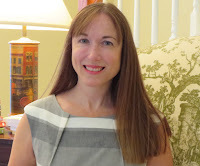 Thanks for guesting blogging, Elizabeth. Happy BBQing. I had a newsletter for my series and it was a great way to keep the fans informed. Thanks for the info, Elizabeth. I'm planning to start a newsletter in the near future, so anything that will help me hit the ground running is appreciated. Great tips. I do have a newsletter, and it's slow work gaining followers. I do offer a free ebook for new subscribers and that has helped. Joylene--Maybe this would be a way to pick things back up again? But I know what you mean...only so many hours in the day! Diane--Especially with a series, I think. Ken--Best wishes getting your newsletter started! Christine--Free is a great incentive! Pat--Oh, I know...the list never ends! But this is a good one to invest time in since we own the subscriber list. Thanks for stopping by! This is great advice, Elizabeth. I've been putting the Newsletter idea on the back burner for a while. Thanks for sharing, Elizabeth. Some great tips here. A newsletter is one of my goals for next year. Susan--Hope you'll take the plunge! Carol--I think that makes a great 2016 goal. :) Thanks for coming by. It just seems EVERYONE is doing a newsletter -- and in the tsunami of newsletters out there, is anyone paying real attention? My blog is my newsletter. My friends know where to find me. As a rare blood courier, I have little enough time to write my posts and the three books I am currently working on! WHEW! What an informative post, Elizabeth! I'm bookmarking it, so I can come back to it later when I'm further along in my writer's journey. Right now I have my hands full just writing my blog and working on my manuscript. I can see the validity in what you have written, as opposed to "Oh God, not another thing I have to do on top of writing!" Good luck with your writing! Roland--Believe me, I know what you mean! That's *exactly* why I was so slow on the newsletter bandwagon. But then I had someone I really respect in the industry to tell me, "Elizabeth, readers are not like you." I needed to hear that because I felt that because more stuff in my inbox would annoy *me*, that it would annoy *them*. But these are people who actively want to keep up with us...and I've seen the power of announcing a release through my newsletter. Sales really responded! I'm the 4th Elizabeth in my family. :) My daughter is the 5th in a row. I guess when you hit on a good name..., ha! Fundy--Don't over do it! Just add it to your "someday" list. Thanks for coming by! I've thought about starting a newsletter, and I'll be referring back to this post when I finally go through with it. Thanks for the advice! Thanks for the newsletter tips, Elizabeth. Its important to connect with readers and make them realise they're more than just subscribers. Spacerguy--Good point--it's important to have a friendly, personal voice, I think, and to show readers we value them by offering them special freebies, etc. Writing a newsletter is somewhere in the future, I hope. Ill see it as a positive move forward as I meet readers who want to connect. Yolanda--Readers do seem to love them! Hilary--I hope you do--you've got so much interesting information to share. And a large number of followers that would want to subscribe! Thanks so much, Elizabeth! Your tips are incredibly useful! I went in and synced Mailchimp with Facebook, and voila, a newsletter link. The offer of free stories with sign-up seems to work well--lots of sign-ups and click-throughs according to Mailchimp. Rebecca--Oh good! Glad it helped. Freebies really do help, don't they? This post is really useful for me. There's a lot more I can do to build my list! Thanks. Thanks. This is info I needed. Nadine--Good luck with the list building! "If Facebook or Twitter were to close down tomorrow..." and with the way social media constantly evolves, who knows what will happen next? This is something to think about... thanks Elizabeth. Michelle--It's something I definitely keep in mind! And thanks for commenting. Lexa--The free books is the best part for us writer-readers! You make a good point about what would happen in Facebook and Twitter closed down. Newsletters would become the way to keep in contact. Great advice. 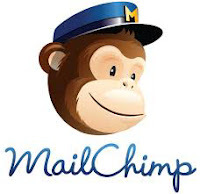 I just started a newsletter on mail chimp and haven't sent out my first one yet, but I plan to do a gift card giveaway. Jennifer--Sounds like a great plan! This was great. I just sent out my first one. I know they will get better and better. Thank for the tip about Canva. I love Canva. Sounds good. I've always wanted to start a newsletter I just don't know what to include.